If Xiahou Ba has fewer than four units of health remaining, he can use "Instigate." If Xiahou Ba has fewer than three units of health remaining, he can use "Roar." If Xiahou Ba has fewer than two units of health remaining, he can use "Godspeed." "Instigate" is one of Jiang Wei's abilities. It allows him to select a character that can reach him in their attack range and force them to play an Attack on him. If they do not, Xiahou Ba selects one of their cards and forcibly discards it. "Roar" is Zhang Fei's ability. It allows him to play as many Attack cards as he would like during his turn without restriction. "Godspeed" is Xiahou Yuan's ability. It allows him to skip his judgement and drawing phases to select any character and attack them. It also allows him to discard an equipment card and select any character and attack them. There are no distance restrictions when using either option of this ability and both options can be used so long as Xiahou Ba has a piece of equipment to discard for option two. Note that Xiahou Ba does not permanently gain "Instigate," "Roar," or "Godspeed" by simply reaching a particular health level. For example, if Xiahou Ba has two units of health then plays a Peach to heal himself, he can no longer use "Roar" until his health level is reduced below three again. Note that Xiahou Ba does not 'lose' abilities as his health level decreases. For example, if Xiahou Ba's health level is reduced from three to two, he does not lose "Instigate." At two units of health, he can use "Instigate" and "Roar." "Rebelling Panther" gives Xiahou Ba quite a few abilities when he is low on health. 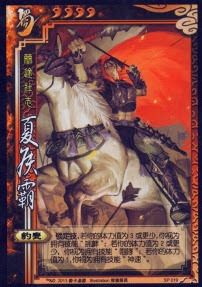 "Instigate" not only gives Xiahou Ba a card destruction ability, but it also helps him more easily become damaged. While this was a drawback for Jiang Wei, it is useful for Xiahou Ba when he is trying to reduce his health level below three to gain "Roar" and use multiple Attacks per turn. Because Xiahou Ba does not have "Roar" at all times, it will come as more of a surprise to his enemies when he acquires it that it would if the player wielding him was Zhang Fei instead. "Godspeed" gives Xiahou Ba a kamikaze move when he is low on health. At full health, Xiahou Ba has no abilities and nothing to rely upon to gain an advantage. While "Instigate" and "Roar" work well together, "Godspeed" does not work well with either of these abilities. Using the first option skips the drawing phase, not allowing him to draw Attacks for "Roar" or Escapes to make "Instigate" less dangerous. Option two skips his action phase, the only part of his turn in which he could use these abilities. Xiahou Ba seems to be a standalone character with few useful allies. Liu Bei/Guo Jia/Xun Yu - These characters can help Xiahou Ba by giving him Attacks and weapons to utilize "Roar." King Xiahou Ba is an extremely poor king choice. He has no defensive options and the extra unit of health makes it more difficult for him to lower his health level to three or lower to gain his abilities. Loyalist Xiahou Ba is a serviceable loyalist choice. His aggressive abilities can help to kill rebels quickly and the three card bounty is nice if he has "Roar," but the rebels will likely be focused on hurting the king. They will not go out of their way to damage Xiahou Ba to activate "Rebelling Panther," so he will have to wait until someone plays Hail of Arrows or Barbarians. Rebel Xiahou Ba is a good rebel choice. With a three-card bounty on his head, he can easily become damaged to activate "Rebelling Panther." Spy Xiahou Ba seems to be a strong spy. His aggressive abilities are useful in swaying the game quickly, so long as he has at least one unit of damage. Xiahou Ba seems to be a novelty character. "Rebelling Panther" is certainly a unique ability. Interestingly enough, Xiahou Ba seems to become more brazen as his health level decreases. When using him, try to stay at three units of health so that you can use "Instigate" to remove cards from your opponents. When you have many Attack cards and three units of health, target a character with many hand cards and pieces of equipment with "Instigate" and try to get them to Attack you. If they take the bait, do not play an Escape. Instead, take the damage and return fire with "Roar!"